Susan, I thoroughly enjoyed your book. Thank you, thank you! I don't believe I've ever read anything dealing with the Salem witch trials. The Shape of Mercy was so fascinating to me. The emotional tug from the story absolutely drew me in. When Lauren was talking about wanting to read to the end without stopping was exactly how I felt! I wanted to bypass Lauren's part of the story and just read the diary entries. You definitely made me "feel" what Lauren was going through. That’s just about the best compliment you can give a novelist. That means a lot to me. I also felt like Lauren in that I knew what she knew she was going to read. So I was intense because I knew that she knew what was going to happen to Mercy. It was like doubled emotions. There she is, anticipating what was coming and here I am anticipating what she's anticipating and knowing Mercy has no clue what's about to happen! I found myself thinking about Mercy's story throughout the day when I was at working wanting to get back and read more of the diary myself! I haven't done it yet, but I want to learn more about the trials. What an interesting and devastating time! Lauren also didn't give herself any grace. I couldn't believe how upset she was with herself because of her assumptions of other people. We all do that, right or wrong. Very true. Firstborns, generally speaking, are driven people; they demand much from themselves and typically seek personal perfection, so it seemed a natural reaction for Lauren to be kind of hard on herself. I am not a firstborn but I know quite a few, and while there are always exceptions to the rule, I have found this to be true for many of the firstborns I know; that they don’t extend much grace to themselves. I can tell you first hand that I have a hard time extending grace to myself and I am a firstborn. I am the exception to the rule when it comes to personal perfection though. My younger brother is the typical firstborn, where I'm more like a middle child. So not fair! I didn't think Lauren was preposterously out of line. Her roommate was pretty harsh! Heck, I thought Clarissa was into Cole and would've come to the same assumption that she was in to him. Can I be candid with you? YES! I'm not one of those people who finds the deeper meaning in stories unless it's totally spelled out for me. Was there a parallel between Lauren's life and Mercy's in regards to the way Lauren viewed people, or was that just part of Lauren's storyline?The main story point here was to reveal how snap judgments transcend time; we’ve always excelled at making them – as much as in the current 21st century as the 17th century. And we too often let fear and groupthink fuel our decision-making process. It’s usually not a very good combination. I know both deal with snap judgments but Mercy's is different with how it's forced on her. Mercy was the one figure - in both her own time and in Lauren’s time as we met Mercy and heard her story - who didn’t let the contagion of making false accusations get to her. She was my Melanie Wilkes (a la Gone With The Wind); the one person in the story who showed us we don’t always have to cave in to our unpretty side. What did you want people to take away from this story? My goal when I write a book is always to entertain and enlighten. If I can keep you turning pages, and then thinking on my characters long after you’ve read the last page, I am happy. With this book, I wanted to explore how I think, how I relate to people different than me, how I respond to fear and the unknown. I can only hope readers do the same when they read it. Why did you write about the Salem witch trials? I was in a play when I was in junior high where I played the role of young woman falsely accused of witchcraft, who later turns on the other girls in her prison cell and orchestrates her release by claiming to be bewitched. I hated the way I felt when I played the role, even now, 35 years later, I still remember how horrible it felt to be accused falsely and then to falsely accuse. Any emotion that powerful is worth channeling into a story. 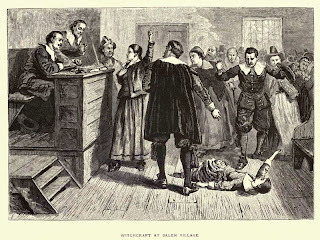 I also wanted to give some honor to those actual people who were accused of witchcraft in Salem and went to the hangman’s noose refusing to confess to something they were not. If they had confessed, they would’ve lived. Yes, they would have been driven from the village, but they would’ve lived. I find that incredibly brave. Were you taken by the people who lost their lives? It'd be interesting to see a book from the perspective of the accusers and the ones who are passing judgement. What kind of research did you do? I noted in the back of the book the resources I used if anyone would like to learn more about this time in our history. I read, searched, and researched for about four months before I wrote a word. Is Mercy a real person from the trials? She is not, nor are the people closest to her, like her father, John Peter, Goody Trumball and Prudence. But the others are real. The list of names of the 19 who died - which the Professor finally shows to Lauren in his office at UC Santa Barbara - is real. Did you find this to be an emotionally hard book to write knowing what you would be writing? I admit writing the diary made me cry at times. I know that sounds a little trite, but it’s true. Mercy was not a real person, but there were people like her who were real who faced what she faced. And it was hard knowing from the very beginning of the diary that I would not be saving her. There would be no rescue. It was imperative to the story that her life should end. And yet, I knew the ending I had planned was to be redemptive. Not “And they all lived happily ever after,” but certainly redemptive. Were there parts of the story that didn't make it in because it was too intense? I never wanted to go into great detail in describing the hangings. I didn’t need to to tell the story and I didn’t want to. And I didn’t spend a great deal of time describing the court room scenes, which were chaotic and frightening, because this was going to be a story about Mercy from her perspective. I wanted people to feel a connection to her and not the sensationalism in the courtroom. So, really, everything that I wanted to be in the story, was in the story. 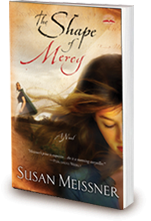 Thank you so much for visiting with me Susan and for giving my visitors an insight into your novel The Shape of Mercy. These were great questions!! Thanks for letting me “visit” your blog! 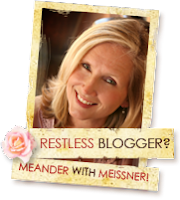 Readers, if you'd like to learn more about Susan and her other books, please visit her site Fiction for the Restless Reader. If you are interested in purchasing her book, enter the title in the Christianbook.com box on the right side of my blog. To enter to win Susan's book, leave a comment letting me know what you know or have heard about the Salem witch trials. In all honesty, I had no clue about the trials other than women being blamed as witches. Please leave an email so I can contact you if you win. Contest open to US residents at this time. Contest will run through 8/3/09. I've heard so much about this book and everything's been positive! That's quite an accomplishment for a book. I studied the Salem Witch trails in highschool and for some reason it put a respective fear in me than. I don't know why. I'm been waiting to read this book every since its release. Would love a chance to win! My daughter and I visited Salem last fall and learned all about the history. Shortly after we returned she read this book and keeps telling me I need to read it too! Great review/interview. I read Shape of Mercy with the "club" a couple of months ago and must say I LOVE THIS BOOK! So if you haven't read it yet, enter this contest to win it and if you don't win it BUY IT! It is so good! This coming from someone who didn't think she would like the book. Oh wait... a snap judgment on my part! This is an excellent book. I haven't heard a lot about the witch hunts other than that most often the women were not given a fair trial. I do remember reading something of the witches being burned at the stake and turning into crows and flying away - of course that probably came from some fiction book. This is my first visit to your blog and I've really enjoyed looking around. I have read some of Susan's books and find her to be a very engaging author. Have heard fantastic things about this book. Would love to win it! Never paid much attention to history when I was in HS. :) I had heard wonderful things about this book as well. So thankful I got to read it! Nise, how awesome that you got to visit Salem! After reading Susan's book I would like to go there, although it would be a hard tour I think. Holly, thanks for the backup! It really is a fantastic book. I hope our club reads it next summer! I love the title of this book, it's short and yet almost poetic. It is food for thought: what shape DOES mercy take? What shapes CAN it take? How will it be shown in this story? It is more than merely "catchy," and yet it is that, too. With my own writing schedule, I don't have time for a lot of reading (fiction) but I would find time for this one. To be honest I haven't heard about this particular subject. It sounds interesting and I would like to see how the subject is handled. Please enter me. I've read this book and LOVED it! I gave away my copy, but want it back so I can read it again! What a lovely review of this book, Mimi! AND a lovely new look to your blog. Just wanted to say Hi as I already have a copy of Susan's book. Keep up the great work, and blessings! Gail, I've done that before: giving away books that I loved like "Linore's book "Before the Season Ends"! Patti, thank you so much for stopping by and for the lovely comment. Thank you for commenting! Sounds like a fascinating book. I remember reading about the Salem witch trials in school and thinking how appalling it was that people could be accused of witchcraft for the flimsiest reasons. Even as a child I recognized how much power was given to the accusers and so little to those accused and was horrified by the injustice of it all. Bookwurm70 is today's book winner. Thank you to everyone who visited my blog and entered to win!! I have heard a great deal about this book and have read quite a bit about the Salem Witch trials. This was a period of American history where hysteria and deceit was rampant. Unfortunately many innocent people lost their lives because of feuds amongst neighbours and the hysteria of young girls.